You’ve likely heard of the concept of Power of Attorney (PoA) before. In essence, a Power of Attorney agreement gives another party (either an individual or a company) the authority to make decisions on your behalf. The most common situations in which the average Canadian will encounter a PoA agreement will likely be medical or legal. Power of Attorney agreements, however, go beyond ensuring your wishes are respected if you’re in a coma. If you want to work with a customs broker like Clearit, for example, Power of Attorney is not just important — it’s required! 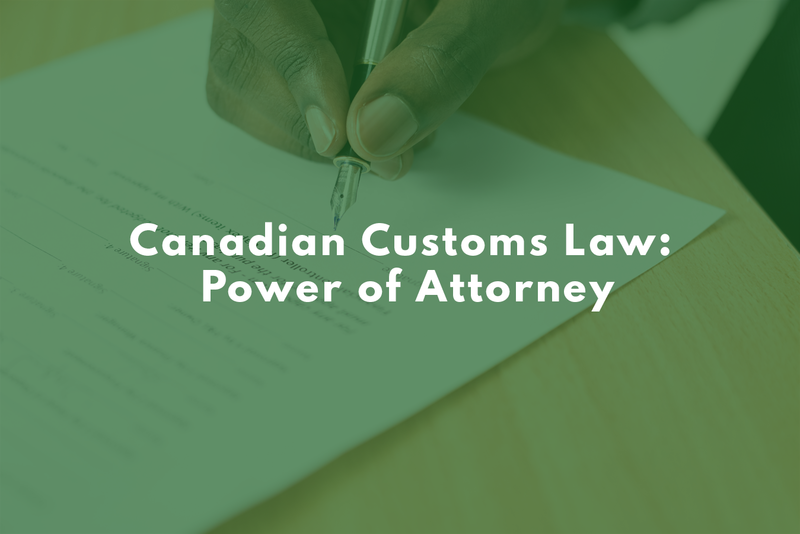 As your trusted customs law experts, we want to make sure all your shipments clear without a hitch, so we’ve put together our guide to filing your customs Power of Attorney! When is Power of Attorney Required? Power of Attorney is required any time an importer works with a customs broker for the purpose of customs-related business. What isn’t required is a singular standard PoA document. Though there are some specific requirements — see below — you may sign a form your broker already has, your own document, or the generic version the Canada Border Services Agency (CBSA) has provided. How do I Establish Power of Attorney? If you’re building your own PoA document, keep in mind that an electronic check-off box can’t be substituted for a signature for the importer or the broker. Officially and legally, whoever signs the PoA must be an authorized officer. While this is technically true, anyone below the highest ranking officer in a company can sign a PoA if they have the right legal authorization. Unless they have reason to doubt, the CBSA generally assumes that if a PoA was signed, the signee had the authority to do so. However, if the CBSA does suspect the PoA was not signed by an authorized party, they may request proof of authority. This will result in all customs business being frozen until CBSA is sure the PoA is legitimate. If you want to avoid any potential problems when establishing Power of Attorney, whoever signs the PoA should either be an executive officer (President, Treasurer, Secretary, VP, CEO, CFO, COO, or equivalent) or someone who has written, provable authorization of a company by-law allowing them to sign on an executive officer’s behalf. Finally, your PoA document can be filed in English or French, but won’t be legitimate in any other language. Power of Attorney authorizes a customs broker to act on your behalf, but it doesn’t absolve you of all responsibility! As brokers, we communicate with the CBSA for you and ensure your shipments are cleared quickly and efficiently, but it’s still your job to provide us with all the information needed to clear your shipment. It’s a good idea to make a clear list of your shipment type, business information, and all relevant invoices before you contact your customs broker to avoid any snags. In addition, Power of Attorney can only be granted to one company or individual per agreement—you’ll hit another snag if you try to authorize two parties on the same PoA. You’ll need to draw up a new document for every PoA agreement. Ready to get importing? Have a question about establishing Power of Attorney? Contact us today!